A dedication service was held May 7 for the new Pleasant Hill UB church, located in the small community of Mount Pleasant about ten miles outside of Muncie, Ind. On May 1, 2005, a fire destroyed the old portion of the church and the sanctuary suffered severe water and smoke damage. Pleasant Hill dates back to 1835, when informal meetings were held. The first church was a log building located near the present church site; a new church was built there in 1860. The building which burned in 2005. When the denomination divided in 1889, the people followed the leadership of Bishop Milton Wright in leaving the main church body. In the process, they, like many other such congregations, lost their building. They held meetings in a sawmill until a new church could be erected in 1892. The church, according to its history, was dedicated debt-free. A room was added around 1915. Sometime later a small basement was dug, and it was expanded to a full basement in 1957. The original belfry was replaced with a new one in 1963. Men and women always sat on opposite sites of the church. That tradition ended following the marriage of Paul and Minnie Huffman, who insisted on sitting together. 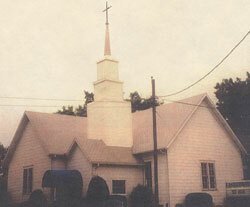 Dr. Ray Seilhamer held revival services at Pleasant Hill in 1976. Afterwards, the congregation decided to build a new sanctuary and fellowship hall. I had the privilege of attending a commitment Sunday service on May 21 at Main Street Church (Walbridge, Ohio), where I served for 12 years prior to this assignment. During this service, the congregation made commitments to a stewardship campaign. The church will probably break ground for a new campus 1.5 miles south of the present building. The plan is to keep the current building for various ministries as well. They hope to break ground in August of this year. It was an exciting service to attend…great worship and challenge! It was the first time I’ve attended a service there since I left in the middle of August. EJ and I really looked forward to greeting many of our friends there. The most often asked question of me was, “Well, how are you enjoying being the bishop now after about nine months?” I’ve been asked that before by others across the church. But I’ve never felt comfortable answering that question. You see, sometimes I feel great about serving the church in this capacity. Then there are other times I’d just as soon be doing something else…anything else. Sometimes I feel I’m making a real contribution to the Kingdom. Other times I wonder what I’m doing here. So, the question is not a simple one to answer. I suppose it is like pastoring 200+ churches at the same time. So in that regard, much of the time I feel like I’m trying to herd cats. Ever tried that? Really hard to do; impossible is more like it. Now, I am a cat person. By just admitting to that, I realize I will probably lose somebody’s respect, maybe “many-bodies.” I don’t have a cat now. Puddin’ died a few years ago after reaching 17 years. She was such a wonderful pet that EJ and I have put off getting another because we don’t think we’d get as good of pet as she was. Plus, we are on the go too much now anyway. We never had a moment of trouble with her. We got Puddin’ when she was six weeks old. She never cried at night, she began using her litter box from the first day we had her, and she continued using it for as long as she lived. But she was a cat. A Siamese at that. Moody at times, temperamental at times, aloof at times, friendly at times–but there was no time that she didn’t think she owned us. Oh yes, she did give me some trouble. Whenever I took Puddin’ to the vet, she turned into a tiger…I mean a real tiger. One time as the vet tried to turn her on the table, she bit my finger and wouldn’t let go. The vet was pregnant and didn’t want to risk being bitten or exposed to my blood, and there was a lot of it. So an assistant came and pried the cat’s teeth apart so I could get my finger back. Then they had to “doctor” me. Every time we took her to the vet after that it, was a struggle. Other than that, she was a pussycat. She was probably a typical cat. She went where she wanted, when she wanted, and how she wanted. You could not herd her any way, shape, or form. But I really enjoyed having her around. I guess that was good training for this present assignment. I have found that I can’t herd pastors or churches, either. Not that I have much of an urge to do so. But yet, “cat” churches can sometimes be a real challenge. Mostly, I spend my time trying to help solve problems and casting a vision that I believe God has placed in my heart, not just for this position but in my heart, period. It is the same vision that should be in all our hearts if we are indeed Christians: to make disciples. Isn’t that it? Isn’t that the vision Jesus left us with? Isn’t that to be the main agenda of our personal life as well as the life of the church? Making disciples is a process. A process that includes evangelism, consolidation (which is the initial new believer follow-up that gets them established in their new-found faith), discipleship (the more in-depth training), and leadership. You see, I want to be involved in this process. I think this is the real task of the church. One thing I have noticed is how little we talk about making disciples, holding one another accountable for making disciples, strategizing how to make disciples, or reporting on our disciple-making efforts. But then, I guess it is easier just to be a “cat” church sometimes and do what we want, when we want, how we want, and where we want, and not worry about anyone else! The Sunfield UB Church (Sunfield, Mich.) and Impact Weslyan Church of Lowell, Mich., are partnering to start a church in Portland, Mich. The launch will be on October 6. On Thursday morning, a fire struck the Jerusalem Chapel UB church in Churchville, Va. The old sanctuary, which goes back over 100 years, and Sunday school facilities were destroyed, causing about $750,l000 of damage. The fire is being blamed on faulty wiring. Bishop Ron Ramsey reports: “I am pleased to announce a pastoral appointment to the Bethel UB Church in Elmore, Ohio. The stationing committee has agreed that Robert Norman Pickett should be appointed to this pastorate. Norman will preach at Bethel this Sunday as a pulpit supply and will begin as the newly appointed pastor the first Sunday in June. “Norman has an AB degree in Christian Education from Point Loma Nazarene University and an MDiv from Bethel Seminary in St. Paul, Minn. He was ordained by the Baptist General Conference in 1982. He was examined and answered the questions asked of candidates for ordination satisfactorily, and upon completion of UB Church History and one year of service to the United Brethren, he will be granted an ordained status. 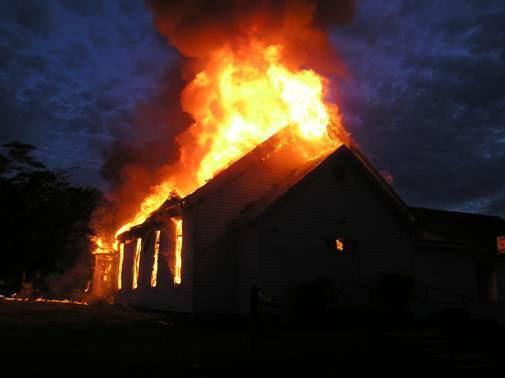 About 5:30 this morning (May 25), a fire was discovered in the “old” section of Jerusalem Chapel in Churchville, Va. The old chapel and Christian education wing in that facility were a total loss. The new sanctuary, offices, fellowship hall, and classrooms appear to be fine, except for some possible smoke damage. It is suspected that an electrical short in the old sanctuary caused the fire. Denny says the trustees and associate pastors are supervising the emergency measures, along with the help of eight local fire departments. 24 May Church Withdrawal – New Castle, Ind. The Eastside UB church in New Castle, Ind., withdrew from the denomination as of March 2006. The pastor was Tom Current. 7 For as he thinks within himself, so he is. He says to you, “Eat and drink!” But his heart is not with you. Our true focus and thought patterns in life determine who we are. If we are stingy, we may invite people to eat and be happy, but inside our real selves scream, “NO!” We do not really join with our guests’ feasting. If we are negative and critical, we may speak some positive statements to others, but not believe them. Inside, we are critical of everything. We do not have (nor give) any hope. The world is gloomy and falling down around us. We are a reflection of our hearts, our true selves. And we can’t hide the reality of that from others for long. Do you believe in a hope-filled, Chirst-honoring, truth-living future? If so, your words and actions will reflect the same and you will dwell upon such things in your heart. If we dwell on defeat, carnal thoughts of resentment or revenge, pride and greed, we will reflect the same. It may not be apparent to the casual observer at first, but what we think about ultimately becomes who we are. So to my prayer warrior friend, I say: yes, there are victories. I received an email of renewed hope from a pastor who is leading his church to intentionally attack over 1200 homes in their area with the Gospel. They are forcefully moving forward with the Gospel and will touch the lives of an estimated 1700 pre-Christians. I praise the Lord for his vision. It is shared by his leadership team. Another church that lost a group of parishioners because of a difference of opinion on how the church should be run has since had more new people come than had left and they are moving ahead with stratigic plans for the future. Their energy is being renewed and vision recaptured. Long-term lack of purpose is being intentionally addressed in another church and for the first time they are working on determining who they are and who they are uniquely gifted to reach in their area. They are excited about the possibilities. This will help them determine the gifts they need in a new pastor. Cluster leaders are doing a great job assisting churches as they face important issues that have hindered them in the past. We believe there is real freedom possible for some churches (and individuals) that have been bound in sinful patterns for years. These are a few of the victories we are seeing. Thanks for the question, Rich. Let’s all ask ourselves, what is it that we think about most? What’s the topic, tone and tenor? Are our thougths rooted in and focused on Christ and Kingdom issues or on something else? Philippians 4:8–Finally, brothers, whatever is true, whatever is noble, whatever is right, whatever is pure, whatever is lovely, whatever is admirable–if anything is excellent or praiseworthy–think about such things. 9Whatever you have learned or received or heard from me, or seen in me–put it into practice. And the God of peace will be with you. 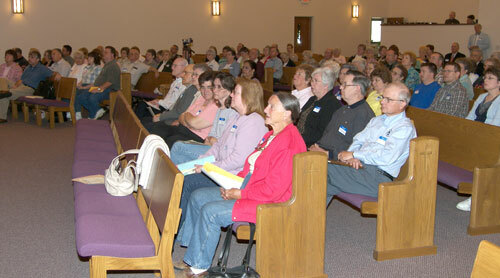 About 120 people from Indiana, Ohio, and Michigan attended the second Day of Missions on May 20. This event was held at the PraisePoint UB church in Willshire, Ohio. Two weeks before, a Day of Missions was held at the Salem UB church in Chambersburg, Pa. That earlier event was attended by about 90 people. 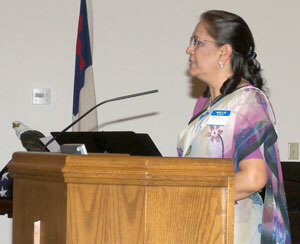 Miriam Prabhakar (right) again opened the meeting by talking about the work in India, and by answering questions from the congregation. New UB missionaries Jamie Fiedler and Anna Gievett, both of whom will begin serving this year with Food for the Hungry, were on hand to talk about their work and call to missions. Tim Flickinger, pastor of the UB church in Fowlerville, Mich., came to talk about the partnership his church has developed with the UB church planting movement in the Copan region of Honduras. A number of former UB missionaries were also present in Willshire: Emmett and Shirley Cox (Sierra Leone), Russ and Nellie Birdsall (Sierra Leone), Eleanore Datema (Jamaica and Sierra Leone), Luke Fetters (Macau), Lynn Mefferd (Sierra Leone), Phil and Darlene Burkett (Macau), and Jeff Sherlock (Macau). For more photos from the event, follow the link below. The UB church in Leavenworth, Kansas, has withdrawn from the denomination. The pastor is Rev. Joseph Trusty. The Zion UB church in Shade, Ohio, has closed.